There was a brief service interruption at approximately 12:30pm, that affected the University website and several web services. Services were restored by 1:30pm. Thank you to the Helpdesk Staff, Lisa, Curtis, and Michael Z., for their attention to the problem and the prompt service recovery. This entry was posted in Uncategorized on November 6, 2016 by Trey Short. Are you afraid of technology? Spooked by updates? Think there’s something scarier than spider memes on the Web? Does data loss make you scream with terror? Bring your tech ghosts and goblins to a fun, informal session where we’ll talk about how to face techphobia. Helpful tricks and tasty treats for everyone in attendance! Feel free to share this event with students who are working on Qualtrics surveys too! All sessions will take place in Ames 129. This entry was posted in Uncategorized on October 26, 2016 by Trey Short. Information Technology Servcies was notified of a phishing email that was directed at 1,700 @iwu.edu email addresses. If you received an email message with the subject UPDATE !!! !, do not click on the links embedded in the message. Just mark the message as spam or delete the message. Know that Information Technology Services will never ask you to provide verify your account or have you send us your login credentials through an email (no service should for that matter). Our email service is supported by Google. We have unlimited storage for email and your account stays with you for life. Always delete any messages you receive asking you to provide login information, or with links to upgrade your account that seem to come from IWU. You will want to change your password and scan your computer for viruses and malware if you clicked on the link in the message. If you have any questions or issues please contact the Help Desk. This entry was posted in Uncategorized on September 23, 2016 by Trey Short. Information Technology Services is launching a new website on August 22. The new site was designed using analytics to determined what people were looking for when they visited the previous ITS website. We hope you like the new clean and easy to navigate ITS website! Thank you to Curtis Kelch and Geoff Castro for their work this summer as they met with others on card sorting sessions, design, and testing. Thank you to the ITS staff for their input and testing as the site development progressed. This entry was posted in Uncategorized on August 22, 2016 by Trey Short. The campus portal MyIWU is changing on June 13. For the most part, the change is cosmetic. The way you log in, access important services like Banner Self-Service and email, and interact with channels like Campus Calendar and Announcements will stay the same. Most users should not experience any disruption when using the new portal. If you currently use Course Studio (My Courses), any Groups or the Luminis SunOne calendar, these services will no longer be available. Please contact Rick Lindquist (rlindqui@iwu.edu) for help with setting up new solutions for your courses or groups and get assistance with exporting your calendar to Google. This entry was posted in Uncategorized on June 10, 2016 by Trey Short. The new authentication system implemented in July of 2015, that supports logging in to IWU services such a email, Moodle, MyIWU, and the wireless network, requires a password change every 180 days for security purposes. Those 180 days are up for much of the campus community this month. Now is a good time to change your password prior to being prompted or wondering why you cannot login to IWU services when your password expires. 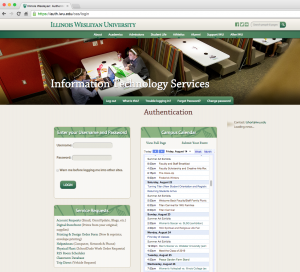 Enter your current password you use to check email, log on to MyIWU, etc. You will need to enter your new password on your portable devices that are used to check email and/or access the wireless network. Apple products will prompt you to enter the new password once your new password is created. Those using Android products will need to go to settings on the device to update the passwords. Please contact the ITS Helpdesk for assistance, or by phone at 309-556-3900. This entry was posted in Operations on January 8, 2016 by Trey Short. Many received an email today addressed from Illinois Wesleyan University with the subject line Illinois Wesleyan University Administrative Systems Alert. I always enjoy when we can turn a phishing scheme into a learning experience. The phishing process starts when an account is compromised. In this case it was one of our student’s accounts. The account was most likely compromised due to a weak password. This is the main reason ITS stresses using strong account passwords. A password that is 12+ characters long, and contains a combination of both upper and lower case letters, numbers, and special characters, is the best way to protect an account. Once the account password was obtained by the phisher, the new owner of the account changed the sender’s name to show as Illinois Wesleyan University, crafted a poorly worded message (who uses the word implore?) with missing punctuation and misspelled words, and included a link that looks like it goes to an IWU server but under closer inspection does not. This person then sent the message to many of us at IWU in an attempt to obtain passwords or to infect computers with a virus or malware. So always delete any messages you receive asking you to provide login information, or with links to upgrade your account that seem to come from IWU. We will never ask you to provide your login credentials through an email! No service of any kind should ask for that matter. Please contact the ITS Help Desk at #3900 for assistance or with any questions. This entry was posted in Operations on December 14, 2015 by Trey Short. CIRBN, the University’s Internet provider, will be performing critical upgrades on network equipment in Bloomington, IL, on November 23, between 12:01am-2:00am. During this time, CIRBN reports that we may experience a brief service outage. Thank you for your patience. On Wednesday, November 25, ITS staff members are performing maintenance on the blade server that supports the majority of computing services we use on campus. Email will be available, but most other services will be unavailable or very unreliable throughout the day. We suggest baking a pie or cookies instead of trying to get any work done. This entry was posted in Uncategorized on November 20, 2015 by Trey Short. 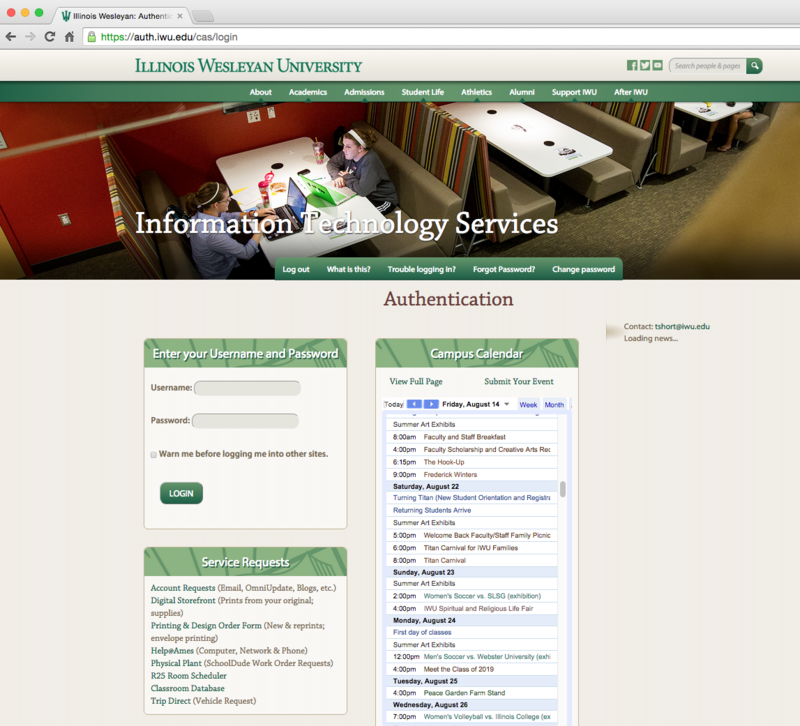 The web page used by the campus community to access IWU online services will have a new look on October 1, 2015. A simplified page will be presented when logging in to Gmail, Google Calendar, Google Drive, OmniUpdate, and Moodle. Some mobile devices do not handle the current authentication page well which keeps these devices from accessing Gmail, Moodle, etc. The web page is the most accessed page on campus. The simplified page reduces load times and server load. This entry was posted in Operations on September 25, 2015 by Trey Short.